The network has its origins in United Independent Broadcasters Inc., a collection of 16 radio stations that was purchased by Paley in 1928 and renamed the Columbia Broadcasting System. Under Paley's guidance, CBS would first become one of the largest radio networks in the United States, and eventually one of the Big Three American broadcast television networks. In 1974, CBS dropped its former full name and became known simply as CBS, Inc. The Westinghouse Electric Corporation acquired the network in 1995, renamed its corporate entity to the current CBS Broadcasting, Inc. in 1997, and eventually adopted the name of the company it had acquired to become CBS Corporation. In 2000, CBS came under the control of Viacom, which was formed as a spin-off of CBS in 1971. In late 2005, Viacom split itself into two separate companies and re-established CBS Corporation – through the spin-off of its broadcast television, radio, and select cable television and non-broadcasting assets – with the CBS television network at its core. CBS Corporation is controlled by Sumner Redstone through National Amusements, which also controls the current Viacom. It was in this climate that Paley set out to "enhance the prestige of CBS, to make it seem in the public mind the more advanced, dignified and socially aware network". He did it through sustaining programming like the New York Philharmonic, the thoughtful drama of Norman Corwin – and an in-house news division to gather and present news, free of fickle suppliers like newspapers and wire services. In the fall of 1934, CBS launched an independent news division, shaped in its first years by Paley's vice-president, former New York Times columnist Ed Klauber, and news director Paul White. Since there was no blueprint or precedent for real-time news coverage, early efforts of the new division used the shortwave link-up CBS had been using for five years  to bring live feeds of European events to its American air. A key early hire was Edward R. Murrow in 1935; his first corporate title was Director of Talks. He was mentored in microphone technique by Robert Trout, the lone full-time member of the News Division, and quickly found himself in a growing rivalry with boss White. Murrow was glad to "leave the hothouse atmosphere of the New York office behind"  when he was dispatched to London as CBS's European Director in 1937, a time when the growing Hitler menace underscored the need for a robust European Bureau. Halberstam described Murrow in London as "the right man in the right place in the right era". Murrow began assembling the staff of broadcast journalists – including William L. Shirer, Charles Collingwood, Bill Downs, and Eric Sevareid – who would become known as the " Murrow Boys". They were "in [Murrow's] own image, sartorially impeccable, literate, often liberal, and prima donnas all". They covered history in the making, and sometimes made it themselves: on March 12, 1938, Hitler boldly annexed nearby Austria and Murrow and Boys quickly assembled coverage with Shirer in London, Edgar Ansel Mowrer in Paris, Pierre Huss in Berlin, Frank Gervasi in Rome and Trout in New York. This bore the News Round-Up format, which is still ubiquitous today in broadcast news. Once the war was over and Murrow returned for good, it was as "a superstar with prestige and freedom and respect within his profession and within his company". He possessed enormous capital within that company, and as the unknown form of television news loomed large, he would spend it freely, first in radio news, then in television, taking on Senator Joseph McCarthy first, then eventually William S. Paley himself,  and with a foe that formidable, even the vast Murrow account would soon run dry. As a result of this, Paley got in 1949 something he had sought for 20 years: CBS finally beat NBC in the ratings. But it was not just to one-up rival Sarnoff that Paley led his talent raid; he, and all of radio, had their eye on the coming force that threw a shadow over radio throughout the 1940s – television. Radio continued to be the backbone of the company, at least in the early 1950s, but it was "a strange, twilight period" where some cities had often multiple television stations which siphoned the audience from radio, while other cities (such as Denver and Portland, Oregon) had no television stations at all. In those areas, as well as rural areas and some entire states, network radio remained the sole, nationally broadcast service. NBC's venerable Fred Allen saw his ratings plummet when he was pitted against upstart ABC's game show Stop The Music! ; within weeks, he was dropped by longtime sponsor Ford Motor Company and was shortly gone from the scene. Radio powerhouse Bob Hope's ratings plunged from a 23.8 share in 1949 to 5.4 in 1953. By 1952, "death seemed imminent for network radio" in its familiar form;  most telling of all, the big sponsors were eager for the switch. 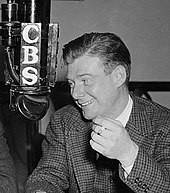 The retirement of Arthur Godfrey in April 1972 marked the end of long-form programming on CBS radio; programming thereafter consisted of hourly news summaries and news features, known in the 1970s as Dimension, and commentaries, including the Spectrum series that evolved into the "Point/Counterpoint" feature on the television network's 60 Minutes and First Line Report, a news and analysis feature delivered by CBS correspondents. The network also continued to offer traditional radio programming through its weeknightly CBS Radio Mystery Theater, the lone sustained holdout of dramatic programming, from 1974 to 1982, though shorter runs were given to the General Mills Radio Adventure Theater and the Sears Radio Theater in the 1970s; otherwise, most new dramatic radio was carried on public and to some extent religious stations. The CBS Radio Network continues to this day, offering hourly newscasts, including its centerpiece CBS World News Roundup in the morning and evening, weekend sister program CBS News Weekend Roundup, the news-related feature segment The Osgood File, What's In the News, a one-minute summary of one story, and various other segments such as commentary from Seattle radio personality Dave Ross, tip segments from various other sources, and technology coverage from CBS Interactive property CNET. On November 17, 2017 CBS Radio was sold to Entercom becoming the last of the original Big Four radio network to be owned by its founding company. Although the CBS parent itself ceased to exist when it was acquired by Westinghouse Electric in 1995, CBS Radio continued to be operated by CBS until its acquisition. Prior to its acquisition, ABC Radio was sold to Citadel Broadcasting in 2007 (and is now a part of Cumulus Media) while Mutual (now defunct) and NBC Radio were acquired by Westwood One in the 1980s (Westwood One and CBS were under common ownership from 1993 to 2007; the former would be acquired outright by Dial Global in October 2011). WCBS-TV would ultimately be the only station (as of 2013 [update]) built and signed on by CBS. The rest of the stations would be acquired by CBS, either in an ownership stake or outright purchase. In television's early years, the network bought Washington, D.C. affiliate WOIC (now WUSA) in a joint venture with The Washington Post in 1950, only to sell its stake to the Post in 1954 due to then-tighter FCC ownership regulations. CBS would also temporarily return to relying on its own UHF technology by owning WXIX in Milwaukee (now CW affiliate WVTV) and WHCT in Hartford, Connecticut (now Univision affiliate WUVN), but as UHF was not viable for broadcasting at the time (due to the fact that most television sets of the time were not equipped with UHF tuners), CBS decided to sell those stations off and affiliate with VHF stations WITI and WTIC-TV (now WFSB), respectively. CBS did attempt to sign on a station in Pittsburgh after the "freeze" was lifted, as that city was then the sixth-largest market but only had one commercial VHF station in DuMont-owned WDTV, while the rest were either on UHF (the modern-day WPGH-TV and WINP-TV) or public television ( WQED). Although the FCC turned down CBS's request to buy the channel 9 license in nearby Steubenville, Ohio and move it to Pittsburgh (that station, initially CBS affiliate WSTV-TV, is now NBC affiliate WTOV-TV), CBS did score a major coup when Pittsburgh-based Westinghouse Electric (a co-founder of NBC with RCA) bought WDTV from struggling DuMont and opted to affiliate the now-recalled KDKA-TV with CBS instead of NBC (like KDKA radio) due to NBC extorting and coercing Westinghouse to trade KYW radio and WPTZ (now KYW-TV) for Cleveland stations WTAM, WTAM-FM (now WMJI), and WNBK (now WKYC); the trade ended up being reversed in 1965 by order of the FCC and the United States Department of Justice after an eight-year investigation. Had CBS not been able to affiliate with KDKA-TV, it would have affiliated with eventual NBC affiliate WIIC-TV (now WPXI) once it signed on in 1957 instead. This coup would eventually lead to a much stronger relationship between Westinghouse and CBS decades later. I Love Lucy debuted in October 1951, and was an immediate sensation, with 11 million out of a population of 15 million Television sets watching (73% share). Paley and network president Frank Stanton had so little faith in the future of Lucille Ball's series, that they granted her wish and allowed her husband, Desi Arnaz, to take financial control of the comedy's production. This was the making of the Ball-Arnaz Desilu empire, and became the template for series production to this day; it also served as the template for some television conventions that continue to exist including the use of a multiple cameras to film scenes, the use of a studio audience and the airing of past episodes for syndication to other television outlets. The phenomenal success of a prime-time, big-money quiz show, The $64,000 Question, propelled its creator, Louis G. Cowan, first to an executive position as CBS's vice-president of creative services, then to the presidency of the CBS TV network itself. When the quiz show scandals involving "rigged" questions surfaced in 1959, Cowan was fired by CBS. As television came to the forefront of American entertainment and information, CBS dominated television as it once had radio. [ citation needed] In 1953, the CBS television network would make its first profit,  and would maintain dominance on television between 1955 and 1976 as well. By the late 1950s, the network often controlled seven or eight of the slots on the "top ten" ratings list with well-respected shows like Route 66. While the "rural" shows got the axe, new hits, like The Mary Tyler Moore Show, All in the Family, The Bob Newhart Show, Cannon, Barnaby Jones, Kojak and The Sonny & Cher Comedy Hour took their place on the network's schedule and kept CBS at the top of the ratings through the early 1970s. The majority of these hits were overseen by then East Coast vice president Alan Wagner. 60 Minutes also moved to the 7:00 p.m. Eastern Time slot on Sundays in 1975 and became the first ever prime time television news program to enter the Nielsen Top 10 in 1978. Silverman also first developed his strategy of spinning new shows off from established hit series while at CBS, with Rhoda and Phyllis spun from The Mary Tyler Moore Show, Maude and The Jeffersons spun from All in the Family and Good Times from Maude. After Silverman's departure, CBS dropped behind ABC for second place in the 1976–77 season, but still rated strongly, based on its earlier hits and some new ones: One Day at a Time, Alice, Lou Grant, WKRP in Cincinnati, The Dukes of Hazzard and, the biggest hit of the early 1980s, Dallas, the latter of which holds the record for the all-time most watched non- series finale single U.S. television episode – the November 21, 1980, primetime telecast of the resolution episode of the internationally prominent " Who Shot J.R.?" cliffhanger. Under network president Jeff Sagansky, the network was able to earn strong ratings from new shows Diagnosis: Murder; Touched by an Angel; Dr. Quinn, Medicine Woman; Walker, Texas Ranger, Picket Fences and a resurgent Jake and the Fatman during this period, and CBS was able to reclaim the first place crown briefly, in the 1992–93 season; however, a drawback for the network during this time-frame was that its programming slate skewed towards an older demographic than ABC, NBC or even Fox, with its relatively limited presence at that time; a joke even floated around that CBS was "the network for the living dead" during this period. In 1993, the network made a breakthrough in establishing a successful late-night talk show franchise to compete with NBC's The Tonight Show when it signed David Letterman away from NBC after the Late Night host was passed over as Johnny Carson's successor on Tonight in favor of Jay Leno. The loss of the NFL, along with an ill-fated effort to court younger viewers, led to a drop in CBS's ratings. One of the shows that was affected was the Late Show with David Letterman, which saw its viewership decline in large part due to the affiliation switches, at times even landing in third place in its timeslot behind ABC's Nightline; as a result, NBC's The Tonight Show with Jay Leno, which the Late Show often dominated over during the first two years of that show's run, became the top-rated late-night talk show. Still, CBS was able to produce some hits during the mid-1990s, such as The Nanny, JAG (which moved to the network from NBC), Chicago Hope, Cosby, Cybill, Touched by an Angel and Everybody Loves Raymond. CBS attempted to court families on Fridays with the launch of a family-oriented comedy block, the " CBS Block Party", in the 1997–98 season (consisting of Family Matters, Step by Step, Meego and The Gregory Hines Show, all but the latter coming from Miller-Boyett Productions, which had maintained a relationship with ABC during the late 1980s and 1990s). The lineup failed to compete against ABC's " TGIF" lineup (which saw its own viewership erode that season): Meego and Hines were cancelled by November, while Family Matters and Step by Step were put on hiatus and ended their runs in the summer of 1998. That winter, CBS aired its last Olympic Games to date with its telecast of the 1998 Winter Games in Nagano; NBC, which had already held the rights to the Summer Olympics since 1988, took over coverage of the Winter Olympics beginning with the 2002 Games. The building blocks for the network's return to the top of the ratings were put in place in 1997, when CBS regained the NFL through its acquisition of the broadcast television rights to the American Football Conference (stripping that package from NBC after 32 years), effective with the 1998 season. The contract was struck shortly before the AFC's emergence as the dominant NFL conference over the NFC, spurred in part by the turnaround of the New England Patriots in the 2000s. With the help of the AFC package, CBS surpassed NBC for first place in the 1998–1999 season; however, it was beaten by ABC the following year. The network gained additional hits in the late 1990s and early 2000s with series such as The King of Queens, Nash Bridges, Judging Amy, Becker and Yes, Dear. CBS became the most watched American broadcast television network once again in the 2005–06 season, an achievement that the network proclaimed in on-air promotions as being "America's Most Watched Network" (a term it would use again in the 2011–12 season). This lasted until the 2007–08 season, when Fox overtook CBS for first, becoming the first non- Big Three network to earn the title as the most watched network overall in the United States; despite CBS's continued strong lineup, Fox's first-place finish that season was primarily due to its reliance on American Idol (the longest reigning #1 prime time U.S. television program from 2004 to 2011) and the effects of the 2007–08 Writers Guild of America strike. CBS retook its place as the top-rated network in the 2008–09 season, where it has remained every season since. Fox and CBS, both having ranked as the highest rated of the major broadcast networks during the 2000s, tend to nearly equal one another in the 18–34, 18–49 and 25–54 demographics, with either network alternating in placing first in either of these groups by very close margins. NCIS, which has been the flagship of CBS's Tuesday lineup for much of its run, became the network's highest-rated drama by the 2007–08 season. In May 1942, WCBW (like almost all television stations) sharply cut back its live program schedule and cancelled its newscasts, as the station temporarily suspended studio operations, resorting exclusively to the occasional broadcast of films. This was primarily due to the fact that much of the staff had either joined the service or were redeployed to war-related technical research, and to prolong the life of the early, unstable cameras which were now impossible to repair due to the lack of parts available during wartime. In May 1944, as the war began to turn in favor of the Allies, WCBW reopened its studios and resumed production of its newscasts, which were briefly anchored by Ned Calmer, and then by Everett Holles. After the war, WCBW (which changed its call letters to WCBS-TV in 1946) introduced expanded news programs on its schedule – first anchored by Milo Boulton, and later by Douglas Edwards. On May 3, 1948, Edwards began anchoring CBS Television News, a regular 15-minute nightly newscast on the rudimentary CBS television network, including WCBS-TV. Airing every weeknight at 7:30 p.m., it was the first regularly scheduled, network television news program featuring an anchor (the nightly Lowell Thomas NBC radio network newscast was simulcast on television locally on NBC's WNBT (now WNBC) for a time in the early 1940s and Hubbell, Calmer, Holles and Boulton on WCBW in the early and mid-1940s, but these were local television broadcasts seen only in the New York City market). In 1950, the nightly newscast was retitled Douglas Edwards with the News, and the following year, it became the first news program to be broadcast on both coasts, thanks to a new coaxial cable connection, prompting Edwards to use the greeting, "Good evening everyone, coast to coast" to begin each edition. The broadcast was renamed the CBS Evening News when Walter Cronkite replaced Edwards in 1962. Edwards remained with CBS News as anchor/reporter for various daytime television and radio news broadcasts until his retirement on April 1, 1988. In other diversification attempts, CBS would buy (and later sell) a varied number of other properties including sports teams (especially the New York Yankees baseball club), book and magazine publishers ( Fawcett Publications including Woman's Day, and Holt, Rinehart and Winston), map-makers and toy manufacturers ( Gabriel Toys, Child Guidance, Wonder Products, Gym Dandy and Ideal), and X-Acto knives.,  and distributors of educational films and film strips, Bailey Films Inc. and Film Associates of California, which it merged into one company, BFA Educational Media. CBS also developed an early home video system called EVR (Electronic Video Recording), but was never able to launch it successfully. Columbia Records was acquired by CBS in 1938. In 1962, CBS launched CBS Records International to market Columbia recordings outside of North America, where the Columbia name was controlled by other entities. In 1966, CBS Records was made a separate subsidiary of Columbia Broadcasting System, Inc.  CBS sold the CBS Records Group to Sony on November 17, 1987, initiating the Japanese buying spree of U.S. companies (such as MCA, Pebble Beach Co., Rockefeller Center and the Empire State Building) that continued into the 1990s. The record label company was rechristened Sony Music Entertainment in 1991, as Sony had a short term license on the CBS name. Forming the CBS Musical Instruments division, the company also acquired Fender (1965–1983), Electro-Music Inc. ( Leslie speakers) (1965–1980), Rogers Drums (1966–1983), Steinway pianos (1972–1985), Gemeinhardt flutes, Lyon & Healy harps (in the late 1970s), Rodgers (institutional) organs, and Gulbransen home organs. The company's last musical instrument manufacturer purchase was its 1981 acquisition of the assets of then-bankrupt ARP Instruments, a developer of electronic synthesizers. By the early 1990s, profits had fallen as a result of competition from cable television and video rentals, and in consequence of the high cost of programming. About 20 former CBS affiliates switched to the rapidly rising Fox network in the mid-1990s, while many television markets across the United States ( KDFX in Palm Springs, California, and KECY in Yuma, Arizona, were reportedly the first to switch in August 1994) lost their CBS affiliate for a while. The network's ratings were acceptable, but it struggled with an image of stodginess. Laurence Tisch lost interest and sought a new buyer. On August 1, 1995, Westinghouse Electric Company acquired CBS outright for $5.4 billion. As one of the major broadcasting group owners of commercial radio and television stations (as Group W) since 1920, Westinghouse sought to transition from a station operator into a major media company with its purchase of CBS. Except for KUTV (which CBS sold to Four Points Media Group in 2007, and is now owned by the Sinclair Broadcast Group), all of the stations involved in the initial Westinghouse deal as well as WWJ-TV remain owned-and-operated stations of the network to this day. Westinghouse's acquisition of CBS had the effect of suddenly turning the combined company's all-news radio stations in New York City ( WCBS and WINS) and Los Angeles ( KNX and KFWB) from bitter rivals to sister stations. While KFWB switched from all-news to news/talk in 2009, WINS and WCBS remain all-news stations, with WINS (which pioneered the all-news format in 1965) concentrating its news coverage on the five core New York City boroughs and WCBS, with its much more powerful signal, covering the surrounding tri-state metropolitan area. In Chicago, the situation started out with Westinghouse's WMAQ beginning to feature long-form stories and discussions about the news, along with a business news focus to differentiate from WBBM until 2000, when an FCC ownership situation had CBS Radio deciding to move its all sports WSCR to WMAQ's signal to sell off the former WSCR facility. In 1997, Westinghouse acquired the Infinity Broadcasting Corporation, owner of more than 150 radio stations, for $4.9 billion. Also that year, Westinghouse created CBS Cable, a division formed through the acquisition of two existing cable channels from the Gaylord Entertainment Company ( The Nashville Network (now Spike) and Country Music Television) and starting a new one ( CBS Eye on People, which was later sold to Discovery Communications). CBS also owned the Spanish-language news network CBS Telenoticias. Following the Infinity purchase, operation and sales responsibilities for the CBS Radio Network was handed to Infinity, which turned management over to Westwood One, a major radio program syndicator that Infinity managed which had previously purchased the Mutual Broadcasting System, NBC's radio networks and the rights to use the "NBC Radio Networks" name. For a time, CBS Radio, NBC Radio Networks and CNN's radio news services were all under the Westwood One umbrella. As of 2008 [update], Westwood One continues to distribute CBS radio programming, but as a self-managed company that put itself up for sale and found a buyer for a significant amount of its stock. Having assembled all the elements of a communications empire, Viacom found that the promised synergy was not there; in 2005, Viacom announced that it would split the company into two separately operated but commonly controlled entities. CBS became the center of a new company, CBS Corporation. The legal successor to the old Viacom, the company's properties included the broadcasting entities (CBS and UPN, the latter of which later merged with Time Warner-owned the WB to form the CW; the Viacom Television Stations Group, which became CBS Television Stations; and CBS Radio); Paramount Television's production operations (now known as CBS Television Studios); Viacom Outdoor advertising (renamed CBS Outdoor); Showtime Networks; Simon & Schuster; and Paramount Parks, which the company sold in May 2006. The other company, which retained the Viacom name, kept Paramount Pictures, assorted MTV Networks, BET Networks, and Famous Music (the latter of which was sold to Sony/ATV Music Publishing in May 2007). As of 2013 [update], CBS provides 87½ hours of regularly scheduled network programming each week. The network provides 22 hours of prime time programming to affiliated stations Monday through Saturday from 8:00–11:00 p.m. Eastern and Pacific (7:00–10:00 p.m. Central/Mountain) and Sunday from 7:00–11:00 p.m. (6:00–10:00 p.m. Central/Mountain). As of 2018 [update], CBS is the only commercial broadcast network that continues to broadcast daytime game shows. Notable game shows that once aired as part of the network's daytime lineup include Match Game, Tattletales, The $10/25,000 Pyramid, Press Your Luck, Card Sharks, Family Feud and Wheel of Fortune. Past game shows that have had both daytime and prime time runs on the network include Beat the Clock, To Tell the Truth and Password. Two long-running prime time-only games were the panel shows What's My Line? and I've Got a Secret. The network is also home to The Talk, a panel talk show similar in format to ABC's The View, which debuted in October 2010 (as of 2018 [update], the program is hosted by moderator Julie Chen, series creator/executive producer Sara Gilbert, Sharon Osbourne, Eve and Sheryl Underwood). As of September 2013 [update], CBS Daytime airs two daytime soap operas each weekday: the hour-long series The Young and the Restless (debuted in 1973) and half-hour series The Bold and the Beautiful (debuted in 1987). CBS has long aired the most soap operas out of the Big Three networks, carrying 3½ hours of soaps on its daytime lineup from 1982 to 2009, and still retains the longest daily schedule. Other than Guiding Light, notable daytime soap operas that once aired on CBS include As the World Turns, Love of Life, Search for Tomorrow, The Secret Storm, The Edge of Night and Capitol. After its agreement with Nelvana ended, the network then entered into a deal with Nickelodeon (which by the time of the deal was a corporate sister to CBS, through the latter's then parent company Viacom, as a result of its 2000 merger with CBS Corporation) to air programming from its Nick Jr. block beginning in September 2000 under the banner Nick Jr. on CBS. From 2002 to 2005, live-action and animated Nickelodeon series aimed at older children also aired as part of the block, under the sub-brand Nick on CBS. CBS was also responsible for airing the series of Young People's Concerts conducted by Leonard Bernstein. Telecast every few months between 1958 and 1972, first in black-and-white and then broadcast in color beginning in 1966, these programs introduced millions of children to classical music through the eloquent commentaries by Maestro Bernstein. The specials were nominated for several Emmy Awards including two wins in 1961 an later in 1966,  and were among the first programs ever broadcast from Lincoln Center for the Performing Arts. On June 1, 1977, it was announced that Elvis Presley had signed a deal with CBS to appear in a new television special. Under the agreement, CBS would videotape Presley's concerts during the summer of 1977; the special was filmed during Presley's final tour at stops in Omaha, Nebraska (on June 19) and Rapid City, South Dakota (on June 21 of that year). CBS aired the special, Elvis in Concert, on October 3, 1977,  nearly two months after Presley's death in his Graceland mansion on August 16. As of April 2018 [update], CBS has 16 owned-and-operated stations, and current and pending affiliation agreements with 227 additional television stations encompassing 49 states, the District of Columbia, two U.S. possessions, Bermuda and St. Vincent and the Grenadines. The network has a national reach of 96.52% of all households in the United States (or 301,605,729 Americans with at least one television set). Currently, New Jersey, New Hampshire and Delaware are the only U.S. states where CBS does not have a locally licensed affiliate (New Jersey is served by New York City O&O WCBS-TV and Philadelphia O&O KYW-TV; Delaware is served by KYW and Salisbury, Maryland affiliate WBOC-TV; and New Hampshire is served by Boston O&O WBZ-TV and Burlington, Vermont affiliate WCAX-TV). CBS maintains affiliations with low-power stations (broadcasting either in analog or digital) in a few markets, such as Harrisonburg, Virginia ( WSVF-CD), Palm Springs, California ( KPSP-CD) and Parkersburg, West Virginia ( WIYE-LD). In some markets, including both of those mentioned, these stations also maintain digital simulcasts on a subchannel of a co-owned/co-managed full-power television station. CBS also maintains a sizeable number of subchannel-only affiliations, the majority of which are with stations in cities located outside of the 50 largest Nielsen-designated markets; the largest CBS subchannel affiliate by market size is KOGG in Wailuku, Hawaii, which serves as a repeater of Honolulu affiliate KGMB (the sister station of KOGG parent KHNL). CBS's master feed is transmitted in 1080i high definition, the native resolution format for CBS Corporation's television properties. However, seven of its affiliates transmit the network's programming in 720p HD, while seven others carry the network feed in 480i standard definition  either due to technical considerations for affiliates of other major networks that carry CBS programming on a digital subchannel or because a primary feed CBS affiliate has not yet upgraded their transmission equipment to allow content to be presented in HD. The CBS television network's initial logo, used from the 1940s to 1951, consisted of an oval spotlight which shone on the block letters "C-B-S". The present-day Eye device was conceived by William Golden, based on a Pennsylvania Dutch hex sign as well as a Shaker drawing (while commonly attributed to Golden, there is speculation that at least some design work on the symbol may have been done by another CBS staff designer, Georg Olden, one of the first African-Americans to attract some attention in the postwar graphic design field). The Eye device made its broadcast debut on October 20, 1951. The following season, as Golden prepared a new "ident", CBS President Frank Stanton insisted on keeping the Eye device and using it as much as possible (Golden died unexpectedly in 1959, and was replaced by one of his top assistants, Lou Dorfsman, who would go on to oversee all print and on-air graphics for CBS for the next 30 years). The CBS eye has since become an American icon. While the symbol's settings have changed, the Eye device itself has not been redesigned in its entire history. As part of a new graphical identity created by Trollbäck + Company that was introduced by the television network in 2006, the eye was placed in a "trademark" position on show titles, days of the week and descriptive words, an approach highly respecting the value of the design. The logo is alternately known as the Eyemark, which was also the name of CBS's domestic and international syndication divisions in the mid-to-late 1990s before the King World acquisition and Viacom merger. The eye logo has frequently been copied or borrowed by television networks around the world. Notable examples include the Austrian Broadcasting System ( ORF), which formerly used a red version of the eye logo; Associated Television (ATV) in the United Kingdom; Frecuencia Latina in Peru; Fuji Television in Japan; Rede Bandeirantes and Rede Globo in Brazil; and Saeta TV Channel 10 in Uruguay. For the 1990–91 season, the campaign featured a new jingle performed by The Temptations, which offered an altered version of their hit " Get Ready". The early 1990s featured less-than-memorable campaigns, with simplified taglines such as "This is CBS" (1992) and "You're On CBS" (1995). Eventually, the promotions department gained momentum again late in the decade with "Welcome Home to a CBS Night" (1996–1997), simplified to Welcome Home (1997–1999) and succeeded by the spin-off campaign "The Address is CBS" (1999–2000), whose history can be traced back to a CBS slogan from the radio era of the 1940s, "The Stars' Address is CBS". During the 1992 season for the end-of-show network identification sequence, a three-note sound mark was introduced, which was eventually adapted into the network's IDs and production company vanity cards following the closing credits of most of its programs during the "Welcome Home" era. Especially during the 1960s, CBS as well as its two major network competitors, NBC, and ABC, utilized elaborate promos during the summer months to promote their upcoming fall schedules. In 1961, CBS took the unusual step of airing a program titled CBS Fall Preview Special: Seven Wonderful Nights,  using stars of several CBS shows – such as Ed Sullivan (The Ed Sullivan Show), Rod Serling (The Twilight Zone), and Raymond Burr and Barbara Hale (Perry Mason) – to promote the upcoming fall lineup, instead the network's continuity announcers, showing previews of the entire lineup for one specific day of the week. Fall preview specials hosted by network stars would become commonplace among the broadcast networks in subsequent years. In Canada, CBS network programming is carried on cable, satellite and IPTV providers in Canada through affiliates and owned-and-operated stations of the network that are located within proximity to the Canada–United States border (such as KIRO-TV/ Seattle, KBJR-DT2/ Duluth, Minnesota, WWJ-TV/ Detroit and WIVB-TV/ Buffalo, New York and WCAX-TV/ Burlington, Vermont ), some of which may also be receivable over-the-air in parts of southern Canada depending on the signal coverage of the station. Most programming is generally the same as it airs in the United States; however, some CBS programming on U.S.-based affiliates permitted for carriage by the Canadian Radio-television and Telecommunications Commission by Canadian cable and satellite providers are subject to simultaneous substitutions, a practice in which a pay television provider supplants an American station's signal with a feed from a Canadian station/network airing a particular program in the same time slot to protect domestic advertising revenue. CBS programming is available in Mexico through affiliates in markets located within proximity to the Mexico–United States border (such as KSWT/ Yuma, Arizona; KVTV/ Laredo, Texas; KDBC-TV/ El Paso, Texas; KGBT-TV/ Harlingen, Texas; and KFMB-TV/ San Diego), whose signals are readily receivable over-the-air in border areas of northern Mexico. In Israel, in 2012 the channels Zone Reality and Zone Romanatica have been rebranded as CBS Reality and CBS Drama, respectively. The channels were carried by Israeli television providers yes and HOT, although as of 2018 [update] they both only carry CBS Reality. In 1995, CBS refused to air a 60 Minutes segment that featured an interview with a former president of research and development for Brown & Williamson, the U.S.'s third largest tobacco company. The controversy raised questions about the legal roles in decision-making and whether journalistic standards should be compromised despite legal pressures and threats. The decision nevertheless sent shockwaves throughout the television industry, the journalism community, and the country. This incident was the basis for the 1999 Michael Mann-directed drama film, The Insider. Fred Silverman 1970–1975 In 1970, Silverman was promoted from vice-president of program planning and development to Vice President, Programs – heading the network's entire programming department. Silverman was the chief architect of the " rural purge" of 1971, which eventually eliminated many popular country-oriented shows (such as Green Acres, Mayberry R.F.D., Hee Haw and The Beverly Hillbillies) from the CBS schedule. In their place, however, came a new wave of classics aimed at the upscale baby boomer generation (such as All in the Family, The Mary Tyler Moore Show, M*A*S*H, The Waltons, Cannon, Barnaby Jones, Kojak and The Sonny & Cher Comedy Hour). Silverman had an uncanny ability to spot burgeoning hit material, especially in the form of spin-offs, new television series developed with characters originating on an existing series. For example, he spun off Maude and The Jeffersons from All in the Family, and Rhoda from Mary Tyler Moore (as well as The Bob Newhart Show from MTM's writers). In early 1974, Silverman ordered a Maude spin-off titled Good Times; that show's success led Silverman to schedule it against ABC's new hit, Happy Days, the following fall. In other dayparts, Silverman also reintroduced game shows to the network's daytime lineup in 1972 after a four-year absence; among the shows Silverman introduced was an updated version of the 1950s game show The Price Is Right, which remains on the air nearly four decades later. After the success of The Price Is Right, Silverman would establish a working relationship with Mark Goodson and Bill Todman in which most of their game shows would air on CBS, including a revival of Match Game. Under Silverman's tenure, CBS also ended the practice of wiping and saved as much of its recorded content as possible, while other networks recycled tapes constantly to save money. On Saturday mornings, Silverman commissioned Hanna-Barbera to produce the animated series Scooby-Doo, Where Are You? (one of the show's main characters, Fred Jones, is named after Silverman). The success of Scooby-Doo led to several other Hanna-Barbera series airing on CBS in the early 1970s. John Backe 1976–1980  Backe returned CBS to the top of the ratings with shows such as Dallas and Trapper John, M.D. that were geared to more adult type fare. B. Donald Grant 1980–1987   During his tenure at CBS, Grant was credited with spearheading some of their best known shows of the 1980s, including: Falcon Crest, Newhart and Murder, She Wrote. Leslie Moonves 1995–1998  Moonves joined CBS in July 1995 as president of CBS Entertainment. He was promoted to President and Chief Executive Officer at CBS Television in April 1998, a position he held until his promotion to Chairman and CEO of CBS Inc. in 2003. Moonves oversees all operations of CBS Corporation, including the CBS television network, The CW (a joint venture between CBS Corporation and Warner Bros. Entertainment formed in 2006 through the concurrent shutdowns of The WB and UPN), CBS Television Stations, CBS Television Studios, CBS Television Distribution, Showtime, CBS Radio, CBS Records, CBS Outdoor, Simon & Schuster, CBS Interactive, CBS Consumer Products, CBS Home Entertainment, CBS Outernet and CBS Films. During this time (2003), CBS became America's most watched television network, going from last to first. Among the shows that have given CBS a new lease on life is the CSI franchise and Survivor. CBS had six of the ten most-watched primetime shows in the final quarter of 2005: CSI, Without a Trace, CSI: Miami, Survivor: Guatemala, NCIS and Cold Case. ^ Bergreen, p. 56. The station changed frequencies again, to 880 kHz, in the Federal Communications Commission (FCC)'s 1941 reassignment of stations ( NARBA); in 1946, WABC was renamed WCBS. ^ Entercom Communications Corp. (2017-11-16). "Form 8-K". Securities and Exchange Commission. Retrieved 2017-11-17. ^ "Shari Redstone withdraws CBS-Viacom merger proposal". CNBC. NBCUniversal. Retrieved 2016-12-17. ^ "These 4 Tech, Media Giants Are In Talks To Buy Lionsgate". Investor's Business Daily. Retrieved 2018-01-19. ^ "CBS, Lionsgate, Viacom heat up media space M&A rumors". FierceCable. Retrieved 2018-01-26. ^ See an illustration of this early logo at "cbs-1949.jpg" ( JPEG). Chuck Pharis Web Page. Retrieved February 16, 2011. ^ Mason, Max (2017-06-12). "Keeping Ten afloat relies on reworking 21st Century Fox and CBS TV deals". Australian Financial Review. Retrieved 22 November 2017. ^ Battersby, Lucy (11 July 2017). "CBS claiming debts of $843 million from Network Ten". The Sydney Morning Herald. Retrieved 16 November 2017. ^ Disis, Brian Stelter and Jill. "CBS reportedly negotiating exit for CEO Les Moonves". CNNMoney. Retrieved 2018-09-06. ^ "As Leslie Moonves Negotiates His Exit from CBS, Six Women Raise New Assault and Harassment Claims". The New Yorker. Retrieved 10 September 2018. ^ "Les Moonves Resigns As CEO Of CBS Amid Sexual Harassment Allegations". Headlines Today. Retrieved 10 September 2018. ^ Andrew Grossman (June–July 2004). "The Smiling Cobra. (Profile of Aubrey)". Variety. pp. 68–73, 78.